Code: 04 of the Code Breakers. Toki's power revolves around magnetism, but later on he also exhibits the ability of mercury manipulation. When he loses his power, he takes the form of his younger self. He's the joker of the group, always fond of teasing people and has a propensity to tell outrageous lies (which fool no one but Sakura), but gets serious when it comes to his sister, Nenene's, safety. He's extremely popular with females and has a strong liking for breasts. He follows the Hammurabi code variation of "an eye for an eye, a tooth for a tooth and the hammer of justice for the wicked". It's later revealed that Toki and Nenene aren't blood siblings. When Nenene met Toki for the first time she was introduced as his older sister. The reason of that was because when Toki was born his magnetism was too powerful so they had to lock it up in "Pandoras box". The Prime Minister thought this was a waste and Toki is also "The Joker" of Eden. He is able to defeat a Rare Kind with his power. Nenene is a spare, another "Joker" Nenene was born by using "the apples of Eden" to create a child to hold the power. As a special power user's DNA greatly affects normal ones, Nenenes left eye was replaced with Toki's right eye. And so, Toki was given Nenene's left eye. After that she started to look like Toki and was able to use the power. Nenene was merely a vessel and Toki got his power taken away from him. Toki, however, couldn't know any of this and was told that only the older sister Nenene inherited the magnetism power from their father. Toki was thus undervalued and attempted to run away from him, until Nenene transferred half of her power (and accordingly, half of her life) to Toki to make him equally special. That's why Toki could use the power of magnetism before opening "Pandora's box". Later, she died protecting him from the Code:Name Saechika. (Toki thought the Re:Code Kouji was the one who killed Nenene for a long time, but it's later revealed that it was actually Saechika.) Nenene is still alive though and while she is in her lost state she doesn't know who Toki is. (Her mind is going back to her childhood). To her, Toki is still a little child. Still, Toki vows to protect Nenene with his life. 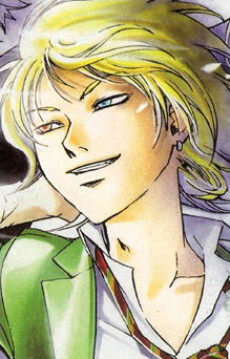 It's later revealed that Toki is not his real name, but rather a name he adopted when he became a Code:Breaker.